My group focuses on structures and host cell interactions of emerging viruses. We study how viruses belonging to families Arenaviridae and Bunyaviridae infect their host cells. Many of these viruses are pathogens causing serious diseases. These include Lassa virus, Rift Valley fever virus, Crimean-Congo hemorrhagic fever virus and many hantaviruses. Despite the medical relevance of arena- and bunyaviruses, very little is known about their detailed three-dimensional structures and infection mechanisms. We use electron cryomicroscopy, combined with computational 3D reconstruction methods, to solve the structures of mature virions, in addition to intermediate structures existing during entry, membrane fusion and maturation. The infection of a host cell by a virus is a complicated process and its study requires a combination of different techniques and model systems. Our electron cryomicroscopy and tomography studies are combined with complementary imaging and biophysical techniques to yield a detailed description of viral infection. For example, we are combining tomographic subvolume averaging techniques and high-resolution single particle electron cryomicroscopy with fitting of X-ray structures of viral glycoproteins into density maps of whole virus particles. Our group is also active in developing computational methods for these tasks. The work is carried out at the Division of Structural Biology (StruBi) and Oxford Particle Imaging Centre (OPIC), which offers a high bio-safety containment laboratory providing facilities for virus production and high resolution electron cryomicroscopy and tomography. Many of the largest known viruses belong to the PRD1-adeno structural lineage characterised by conserved pseudo-hexameric capsomers composed of three copies of a single major capsid protein (MCP). Here, by high-resolution cryo-EM analysis, we show that a class of archaeal viruses possess hetero-hexameric MCPs which mimic the PRD1-adeno lineage trimer. These hetero-hexamers are built from heterodimers and utilise a jigsaw-puzzle system of pegs and holes, and underlying minor capsid proteins, to assemble the capsid laterally from the 5-fold vertices. At these vertices proteins engage inwards with the internal membrane vesicle whilst 2-fold symmetric horn-like structures protrude outwards. The horns are assembled from repeated globular domains attached to a central spine, presumably facilitating multimeric attachment to the cell receptor. Such viruses may represent precursors of the main PRD1-adeno lineage, similarly engaging cell-receptors via 5-fold spikes and using minor proteins to define particle size. Lipid membrane fusion is an essential function in many biological processes. Detailed mechanisms of membrane fusion and the protein structures involved have been mainly studied in eukaryotic systems, whereas very little is known about membrane fusion in prokaryotes. 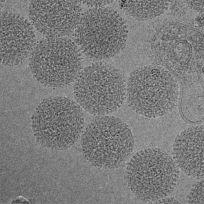 Haloarchaeal pleomorphic viruses (HRPVs) have a membrane envelope decorated with spikes that are presumed to be responsible for host attachment and membrane fusion. Here we determine atomic structures of the ectodomains of the 57-kDa spike protein VP5 from two related HRPVs revealing a previously unreported V-shaped fold. By Volta phase plate cryo-electron tomography we show that VP5 is monomeric on the viral surface, and we establish the orientation of the molecules with respect to the viral membrane. We also show that the viral membrane fuses with the host cytoplasmic membrane in a process mediated by VP5. This sheds light on protein structures involved in prokaryotic membrane fusion. Dengue virus is a major pathogen, and severe infections can lead to life-threatening dengue hemorrhagic fever. Dengue virus exists as four serotypes, and dengue hemorrhagic fever is often associated with secondary heterologous infections. Antibody-dependent enhancement (ADE) may drive higher viral loads in these secondary infections and is purported to result from antibodies that recognize dengue virus but fail to fully neutralize it. Here we characterize two antibodies, 2C8 and 3H5, that bind to the envelope protein. Antibody 3H5 is highly unusual as it not only is potently neutralizing but also promotes little if any ADE, whereas antibody 2C8 has strong capacity to promote ADE. We show that 3H5 shows resilient binding in endosomal pH conditions and neutralizes at low occupancy. Immunocomplexes of 3H5 and dengue virus do not efficiently interact with Fcγ receptors, which we propose is due to the binding mode of 3H5 and constitutes the primary mechanism of how ADE is avoided. Double-stranded RNA (dsRNA) viruses package several RNA-dependent RNA polymerases (RdRp) together with their dsRNA genome into an icosahedral protein capsid known as the polymerase complex. This structure is highly conserved among dsRNA viruses but is not found in any other virus group. RdRp subunits typically interact directly with the main capsid proteins, close to the 5-fold symmetric axes, and perform viral genome replication and transcription within the icosahedral protein shell. In this study, we utilized Pseudomonas phage Φ6, a well-established virus self-assembly model, to probe the potential roles of the RdRp in dsRNA virus assembly. We demonstrated that Φ6 RdRp accelerates the polymerase complex self-assembly process and contributes to its conformational stability and integrity. We highlight the role of specific amino acid residues on the surface of the RdRp in its incorporation during the self-assembly reaction. Substitutions of these residues reduce RdRp incorporation into the polymerase complex during the self-assembly reaction. Furthermore, we determined that the overall transcription efficiency of the Φ6 polymerase complex increased when the number of RdRp subunits exceeded the number of genome segments. These results suggest a mechanism for RdRp recruitment in the polymerase complex and highlight its novel role in virion assembly, in addition to the canonical RNA transcription and replication functions.IMPORTANCE Double-stranded RNA viruses infect a wide spectrum of hosts, including animals, plants, fungi, and bacteria. Yet genome replication mechanisms of these viruses are conserved. During the infection cycle, a proteinaceous capsid, the polymerase complex, is formed. An essential component of this capsid is the viral RNA polymerase that replicates and transcribes the enclosed viral genome. The polymerase complex structure is well characterized for many double-stranded RNA viruses. However, much less is known about the hierarchical molecular interactions that take place in building up such complexes. Using the bacteriophage Φ6 self-assembly system, we obtained novel insights into the processes that mediate polymerase subunit incorporation into the polymerase complex for generation of functional structures. The results presented pave the way for the exploitation and engineering of viral self-assembly processes for biomedical and synthetic biology applications. An understanding of viral assembly processes at the molecular level may also facilitate the development of antivirals that target viral capsid assembly. 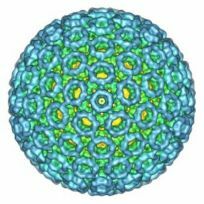 Cryogenic transmission electron microscopy (cryo-EM) is widely used to determine high-resolution structures of symmetric virus capsids. The method holds promise for extending studies beyond purified capsids and their symmetric protein shells. The non-symmetric genome component has been addressed in dsRNA cypoviruses and ssRNA bacteriophages Qβ and MS2. The structure of human herpes simplex virus type 1 capsids has been determined within intact virions to resolve capsid-tegument interactions. Electron tomography under cryogenic conditions (cryo-ET), has allowed resolving an early membrane fusion intermediate of Rift Valley fever virus. Antibody-affinity based sample grids allow capturing of virions directly from cell cultures or even clinical samples. These and other emerging methods will support studies to address viral entry, assembly and neutralization processes at increasingly high resolutions and native conditions. CarD is an essential global transcription regulator from Mycobacterium tuberculosis (Mtb) that binds RNA polymerase and activates transcription by stabilizing the transcription initiation complex. Available crystal structures have captured two distinct, monomeric and domain-swapped homodimeric, oligomeric states of CarD. However, the actual oligomeric state of CarD in solution and its biological relevance has remained unclear. Here, we confirm the presence of the homodimeric state of CarD in solution by using synchrotron-based small-angle X-ray scattering. Furthermore, by using biochemical and biophysical experiments, in addition to mass-spectrometry, transmission electron microscopy, and confocal imaging, we show that CarD is the first soluble cytosolic protein in Mtb which displays the tendency to form amyloid-like fibrils both in vitro as well as in vivo. We demonstrate that the deletion of the fourteen N-terminal residues involved in domain-swapping hampers amyloid formation, thus, suggesting that domain-swapping is crucial in amyloidogenesis. 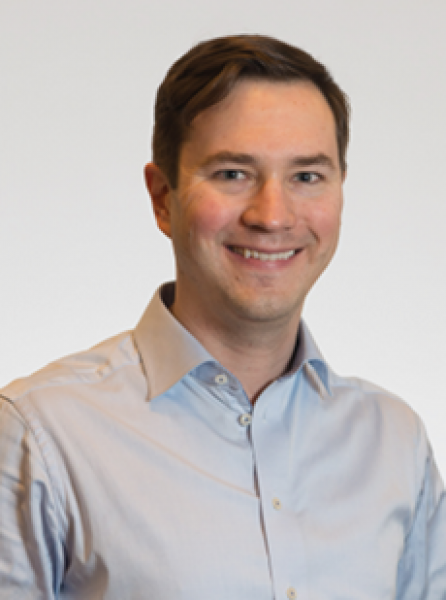 The discovery of the amyloidogenic property of an essential cytosolic global transcription regulator, CarD, in a pathogenic bacteria will further open up new frontiers in research. Viruses are a significant threat to both human health and the economy, and there is an urgent need for novel anti-viral drugs and vaccines. High-resolution viral structures inform our understanding of the virosphere, and inspire novel therapies. Here we present a method of obtaining such structural information that avoids potentially disruptive handling, by collecting diffraction data from intact infected cells. We identify a suitable combination of cell type and virus to accumulate particles in the cells, establish a suitable time point where most cells contain virus condensates and use electron microscopy to demonstrate that these are ordered crystalline arrays of empty capsids. We then use an X-ray free electron laser to provide extremely bright illumination of sub-micron intracellular condensates of bacteriophage phiX174 inside living Escherichia coli at room temperature. We have been able to collect low resolution diffraction data. Despite the limited resolution and completeness of these initial data, due to a far from optimal experimental setup, we have used novel methodology to determine a putative space group, unit cell dimensions, particle packing and likely maturation state of the particles. Cryogenic transmission electron microscopy (cryo-TEM) is a high-resolution biological imaging method, whereby biological samples, such as purified proteins, macromolecular complexes, viral particles, organelles and cells, are embedded in vitreous ice preserving their native structures. Due to sensitivity of biological materials to the electron beam of the microscope, only relatively low electron doses can be applied during imaging. As a result, the signal arising from the structure of interest is overpowered by noise in the images. To increase the signal-to-noise ratio, different image processing-based strategies that aim at coherent averaging of signal have been devised. In such strategies, images are generally assumed to arise from multiple identical copies of the structure. Prior to averaging, the images must be grouped according to the view of the structure they represent and images representing the same view must be simultaneously aligned relatively to each other. For computational reconstruction of the three-dimensional structure, images must contain different views of the original structure. Structures with multiple symmetry-related substructures are advantageous in averaging approaches because each image provides multiple views of the substructures. However, the symmetry assumption may be valid for only parts of the structure, leading to incoherent averaging of the other parts. Several image processing approaches have been adapted to tackle symmetry-mismatched substructures with increasing success. Such structures are ubiquitous in nature and further computational method development is needed to understanding their biological functions. Archaeal viruses have evolved to infect hosts often thriving in extreme conditions such as high temperatures. However, there is a paucity of information on archaeal virion structures, genome packaging, and determinants of temperature resistance. 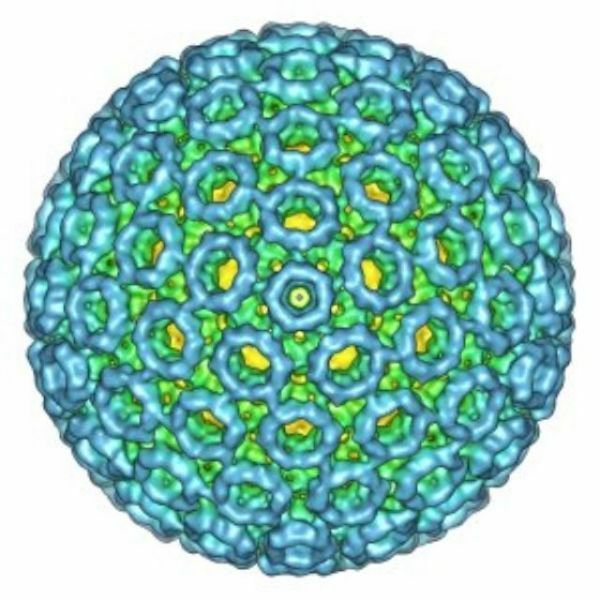 The rod-shaped virus APBV1 (Aeropyrum pernix bacilliform virus 1) is among the most thermostable viruses known; it infects a hyperthermophile Aeropyrum pernix, which grows optimally at 90 °C. Here we report the structure of APBV1, determined by cryo-electron microscopy at near-atomic resolution. Tight packing of the major virion glycoprotein (VP1) is ensured by extended hydrophobic interfaces, and likely contributes to the extreme thermostability of the helical capsid. The double-stranded DNA is tightly packed in the capsid as a left-handed superhelix and held in place by the interactions with positively charged residues of VP1. The assembly is closed by specific capping structures at either end, which we propose to play a role in DNA packing and delivery. Viruses have impacted the biosphere in numerous ways since the dawn of life. However, the evolution, genetic, structural, and taxonomic diversity of viruses remain poorly understood, in part because sparse sampling of the virosphere has concentrated mostly on exploring the abundance and diversity of dsDNA viruses. Furthermore, viral genomes are highly diverse, and using only the current sequence-based methods for classifying viruses and studying their phylogeny is complicated. 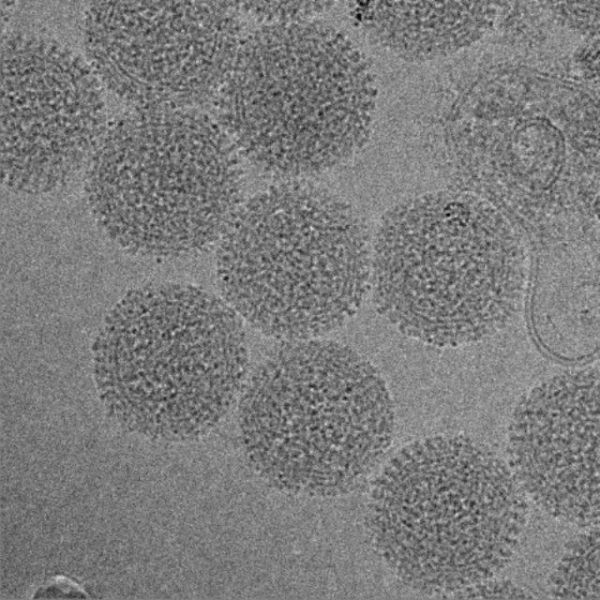 Here we describe a virus, FLiP (Flavobacterium-infecting, lipid-containing phage), with a circular ssDNA genome and an internal lipid membrane enclosed in the icosahedral capsid. The 9,174-nt-long genome showed limited sequence similarity to other known viruses. The genetic data imply that this virus might use replication mechanisms similar to those found in other ssDNA replicons. However, the structure of the viral major capsid protein, elucidated at near-atomic resolution using cryo-electron microscopy, is strikingly similar to that observed in dsDNA viruses of the PRD1-adenovirus lineage, characterized by a major capsid protein bearing two β-barrels. The strong similarity between FLiP and another member of the structural lineage, bacteriophage PM2, extends to the capsid organization (pseudo T = 21 dextro) despite the difference in the genetic material packaged and the lack of significant sequence similarity. The integration of cellular and molecular structural data is key to understanding the function of macromolecular assemblies and complexes in their in vivo context. Here we report on the outcomes of a workshop that discussed how to integrate structural data from a range of public archives. The workshop identified two main priorities: the development of tools and file formats to support segmentation (that is, the decomposition of a three-dimensional volume into regions that can be associated with defined objects), and the development of tools to support the annotation of biological structures. Although several different flaviviruses may cause encephalitis, Japanese encephalitis virus is the most significant, being responsible for thousands of deaths each year in Asia. The structural and molecular basis of this encephalitis is not fully understood. Here, we report the cryo-electron microscopy structure of mature Japanese encephalitis virus at near-atomic resolution, which reveals an unusual "hole" on the surface, surrounded by five encephalitic-specific motifs implicated in receptor binding. Glu138 of E, which is highly conserved in encephalitic flaviviruses, maps onto one of these motifs and is essential for binding to neuroblastoma cells, with the E138K mutation abrogating the neurovirulence and neuroinvasiveness of Japanese encephalitis virus in mice. We also identify structural elements modulating viral stability, notably Gln264 of E, which, when replaced by His264 strengthens a hydrogen-bonding network, leading to a more stable virus. These studies unveil determinants of neurovirulence and stability in Japanese encephalitis virus, opening up new avenues for therapeutic interventions against neurotropic flaviviruses.Japanese encephalitis virus (JEV) is a Flavivirus responsible for thousands of deaths every year for which there are no specific anti-virals. Here, Wang et al. report the cryo-EM structure of mature JEV at near-atomic resolution and identify structural elements that modulate stability and virulence. Correct outer protein shell assembly is a prerequisite for virion infectivity in many multi-shelled dsRNA viruses. In the prototypic dsRNA bacteriophage φ6, the assembly reaction is promoted by calcium ions but its biomechanics remain poorly understood. Here, we describe the near-atomic resolution structure of the φ6 double-shelled particle. The outer T=13 shell protein P8 consists of two alpha-helical domains joined by a linker, which allows the trimer to adopt either a closed or an open conformation. The trimers in an open conformation swap domains with each other. Our observations allow us to propose a mechanistic model for calcium concentration regulated outer shell assembly. Furthermore, the structure provides a prime exemplar of bona fide domain-swapping. This leads us to extend the theory of domain-swapping from the level of monomeric subunits and multimers to closed spherical shells, and to hypothesize a mechanism by which closed protein shells may arise in evolution. Mutations in either polycystin-1 (PC1 or PKD1) or polycystin-2 (PC2, PKD2 or TRPP1) cause autosomal-dominant polycystic kidney disease (ADPKD) through unknown mechanisms. Here we present the structure of human PC2 in a closed conformation, solved by electron cryomicroscopy at 4.2-Å resolution. The structure reveals a novel polycystin-specific 'tetragonal opening for polycystins' (TOP) domain tightly bound to the top of a classic transient receptor potential (TRP) channel structure. The TOP domain is formed from two extensions to the voltage-sensor-like domain (VSLD); it covers the channel's endoplasmic reticulum lumen or extracellular surface and encloses an upper vestibule, above the pore filter, without blocking the ion-conduction pathway. The TOP-domain fold is conserved among the polycystins, including the homologous channel-like region of PC1, and is the site of a cluster of ADPKD-associated missense variants. Extensive contacts among the TOP-domain subunits, the pore and the VSLD provide ample scope for regulation through physical and chemical stimuli. Polycystin-2 (PC2), a calcium-activated cation TRP channel, is involved in diverse Ca2+ signaling pathways. Malfunctioning Ca2+ regulation in PC2 causes autosomal-dominant polycystic kidney disease. Here we report two cryo-EM structures of distinct channel states of full-length human PC2 in complex with lipids and cations. The structures reveal conformational differences in the selectivity filter and in the large exoplasmic domain (TOP domain), which displays differing N-glycosylation. The more open structure has one cation bound below the selectivity filter (single-ion mode, PC2SI), whereas multiple cations are bound along the translocation pathway in the second structure (multi-ion mode, PC2MI). Ca2+ binding at the entrance of the selectivity filter suggests Ca2+ blockage in PC2MI, and we observed density for the Ca2+-sensing C-terminal EF hand in the unblocked PC2SI state. The states show altered interactions of lipids with the pore loop and TOP domain, thus reflecting the functional diversity of PC2 at different locations, owing to different membrane compositions. Non-segmented, (-)RNA viruses cause serious human diseases. Human metapneumovirus (HMPV), an emerging pathogen of this order of viruses (Mononegavirales) is one of the main causes of respiratory tract illness in children. To help elucidate the assembly mechanism of the nucleocapsid (the viral RNA genome packaged by the nucleoprotein N) we present crystallographic structures of HMPV N in its assembled RNA-bound state and in a monomeric state, bound to the polymerase cofactor P. Our structures reveal molecular details of how P inhibits the self-assembly of N and how N transitions between the RNA-free and RNA-bound conformational state. Notably, we observe a role for the C-terminal extension of N in directly preventing premature uptake of RNA by folding into the RNA-binding cleft. Our structures suggest a common mechanism of how the growth of the nucleocapsid is orchestrated, and highlight an interaction site representing an important target for antivirals. Many phleboviruses (family Bunyaviridae) are emerging as medically important viruses. These viruses enter target cells by endocytosis and low pH-dependent membrane fusion in late endosomes. However, the necessary and sufficient factors for fusion have not been fully characterized. We have studied the minimal fusion requirements of a prototypic phlebovirus, Uukuniemi virus, in an in vitro virus-liposome assay. We show that efficient lipid mixing between viral and liposome membranes requires close to physiological temperatures and phospholipids with negatively charged headgroups, such as the late endosomal phospholipid bis(monoacylglycero)phosphate. We further demonstrate that bis(monoacylglycero)phosphate increases Uukuniemi virus fusion beyond the lipid mixing stage. By using electron cryotomography of viral particles in the presence or absence of liposomes, we observed that the conformation of phlebovirus glycoprotein capsomers changes from the native conformation toward a more elongated conformation at a fusion permissive pH. Our results suggest a rationale for phlebovirus entry in late endosomes. Electron cryomicroscopy can yield near-atomic resolution structures of highly ordered macromolecular complexes. Often however some subunits bind in a flexible manner, have different symmetry from the rest of the complex, or are present in sub-stoichiometric amounts, limiting the attainable resolution. Here we report a general method for the localized three-dimensional reconstruction of such subunits. After determining the particle orientations, local areas corresponding to the subunits can be extracted and treated as single particles. We demonstrate the method using three examples including a flexible assembly and complexes harbouring subunits with either partial occupancy or mismatched symmetry. Most notably, the method allows accurate fitting of the monomeric RNA-dependent RNA polymerase bound at the threefold axis of symmetry inside a viral capsid, revealing for the first time its exact orientation and interactions with the capsid proteins. Localized reconstruction is expected to provide novel biological insights in a range of challenging biological systems. The matrix protein (M) of paramyxoviruses plays a key role in determining virion morphology by directing viral assembly and budding. Here, we report the crystal structure of the human metapneumovirus M at 2.8 Å resolution in its native dimeric state. The structure reveals the presence of a high-affinity Ca²⁺ binding site. Molecular dynamics simulations (MDS) predict a secondary lower-affinity site that correlates well with data from fluorescence-based thermal shift assays. By combining small-angle X-ray scattering with MDS and ensemble analysis, we captured the structure and dynamics of M in solution. Our analysis reveals a large positively charged patch on the protein surface that is involved in membrane interaction. Structural analysis of DOPC-induced polymerization of M into helical filaments using electron microscopy leads to a model of M self-assembly. The conservation of the Ca²⁺ binding sites suggests a role for calcium in the replication and morphogenesis of pneumoviruses. Negative-strand RNA viruses represent a significant class of important pathogens that cause substantial morbidity and mortality in human and animal hosts worldwide. A defining feature of these viruses is that their single-stranded RNA genomes are of opposite polarity to messenger RNA and are replicated through a positive-sense intermediate. The replicative intermediate is thought to exist as a complementary ribonucleoprotein (cRNP) complex. However, isolation of such complexes from infected cells has never been accomplished. Here we report the development of an RNA-based affinity-purification strategy for the isolation of cRNPs of influenza A virus from infected cells. This technological advance enabled the structural and functional characterization of this elusive but essential component of the viral RNA replication machine. The cRNP exhibits a filamentous double-helical organization with defined termini, containing the viral RNA-dependent RNA polymerase (RdRp) at one end and a loop structure at the other end. In vitro characterization of cRNP activity yielded mechanistic insights into the workings of this RNA synthesis machine. In particular, we found that cRNPs show activity in vitro only in the presence of added RdRp. Intriguingly, a replication-inactive RdRp mutant was also able to activate cRNP-templated viral RNA synthesis. We propose a model of influenza virus genome replication that relies on the trans-activation of the cRNP-associated RdRp. The described purification strategy should be applicable to other negative-strand RNA viruses and will promote studies into their replication mechanisms. The multitude of archaea and bacteria inhabiting extreme environments has only become evident during the last decades. As viruses apply a significant evolutionary force to their hosts, there is an inherent value in learning about viruses infecting these extremophiles. In this study, we have focused on one such unique virus-host pair isolated from a hypersaline environment: an icosahedral, membrane-containing double-stranded DNA virus--Salisaeta icosahedral phage 1 (SSIP-1) and its halophilic host bacterium Salisaeta sp. SP9-1 closely related to Salisaeta longa. The architectural principles, virion composition, and the proposed functions associated with some of the ORFs of the virus are surprisingly similar to those found in viruses belonging to the PRD1-adenovirus lineage. The virion structure, determined by electron cryomicroscopy, reveals that the bulk of the outer protein capsid is composed of upright standing pseudohexameric capsomers organized on a T = 49 icosahedral lattice. Our results give a comprehensive description of a halophilic virus-host system and shed light on the relatedness of viruses based on their virion architecture. Measles virus is a highly infectious, enveloped, pleomorphic virus. We combined electron cryotomography with subvolume averaging and immunosorbent electron microscopy to characterize the 3D ultrastructure of the virion. We show that the matrix protein forms helices coating the helical ribonucleocapsid rather than coating the inner leaflet of the membrane, as previously thought. The ribonucleocapsid is folded into tight bundles through matrix-matrix interactions. The implications for virus assembly are that the matrix already tightly interacts with the ribonucleocapsid in the cytoplasm, providing a structural basis for the previously observed regulation of RNA transcription by the matrix protein. Next, the matrix-covered ribonucleocapsids are transported to the plasma membrane, where the matrix interacts with the envelope glycoproteins during budding. These results are relevant to the nucleocapsid organization and budding of other paramyxoviruses, where isolated matrix has been observed to form helices. Rift Valley fever virus (RVFV) is a highly pathogenic member of the family Bunyaviridae that needs to be handled under biosafety level (BSL) 3 conditions. Here, we describe reverse genetics systems to measure RVFV polymerase activity in mammalian cells and to generate virus-like particles (VLPs). Recombinant polymerase (L) and nucleocapsid protein (N), expressed together with a minireplicon RNA, formed transcriptionally active nucleocapsids. These could be packaged into VLPs by additional expression of viral glycoproteins. The VLPs resembled authentic virus particles and were able to infect new cells. After infection, VLP-associated nucleocapsids autonomously performed primary transcription, and co-expression of L and N in VLP-infected cells allowed subsequent replication and secondary transcription. Bunyaviruses are potently inhibited by a human interferon-induced protein, MxA. However, the affected step in the infection cycle is not entirely characterized. Using the VLP system, we demonstrate that MxA inhibits both primary and secondary transcriptions of RVFV. A set of infection assays distinguishing between virus attachment, entry, and subsequent RNA synthesis confirmed that MxA is able to target immediate early RNA synthesis of incoming RVFV particles. Thus, our reverse genetics systems are useful for dissecting individual steps of RVFV infection under non-BSL3 conditions. Packaging of the Cystovirus varphi8 genome into the polymerase complex is catalysed by the hexameric P4 packaging motor. The motor is located at the fivefold vertices of the icosahedrally symmetric polymerase complex, and the symmetry mismatch between them may be critical for function. We have developed a novel image-processing approach for the analysis of symmetry-mismatched structures and applied it to cryo-electron microscopy images of P4 bound to the polymerase complex. This approach allowed us to solve the three-dimensional structure of the P4 in situ to 15-A resolution. The C-terminal face of P4 was observed to interact with the polymerase complex, supporting the current view on RNA translocation. We suggest that the symmetry mismatch between the two components may facilitate the ring opening required for RNA loading prior to its translocation. Viruses with an icosahedrally symmetric protein capsid and a membrane infect hosts from all three domains of life. Similar architectural principles are shared by different viral families, as exemplified by double-stranded DNA viruses such as PRD1 and STIV. During virus assembly, the membrane lipids are selectively acquired from the host cell. The X-ray structure of bacteriophage PRD1 revealed that the lipids are asymmetrically distributed between the two leaflets and facet length is controlled by a tape-measure protein. In most membrane-containing viruses, viral and host membranes fuse during viral entry. In the best-understood systems of the alphaviruses, flaviviruses and herpes viruses, fusion is mediated by viral glycoproteins. Recent structural advances reveal how very different protein architectures can be used to form trimeric extensions that extend into the target cell membrane and then fold back to mediate fusion of the target and viral membranes. The enveloped dsRNA bacteriophages phi6 and phi8 are the two most distantly related members of the Cystoviridae family. Their structure and function are similar to that of the Reoviridae but their assembly can be conveniently studied in vitro. Electron cryomicroscopy and three-dimensional icosahedral reconstruction were used to determine the structures of the phi6 virion (14 A resolution), phi8 virion (18 A resolution), and phi8 core (8.5 A resolution). Spikes protrude 2 nm from the membrane bilayer in phi6 and 7 nm in phi8. In the phi6 nucleocapsid, 600 copies of P8 and 72 copies of P4 interact with the membrane, whereas in phi8 it is only P4 and 60 copies of a minor protein. The major polymerase complex protein P1 forms a dodecahedral shell from 60 asymmetric dimers in both viruses, but the alpha-helical fold has apparently diverged. These structural differences reflect the different host ranges and entry and assembly mechanisms of the two viruses. Bacteriophage phi6 is an enveloped dsRNA virus with a segmented genome. Phi6 specifically packages one copy of each of its three genome segments into a preassembled polymerase complex. This leads to expansion of the polymerase complex, minus and plus strand RNA synthesis, and assembly of the nucleocapsid. The phi6 in vitro assembly and packaging system is a valuable model for dsRNA virus replication. The structure of the nucleocapsid at 7.5 A resolution presented here reveals the secondary structure of the two major capsid proteins. Asymmetric P1 dimers organize as an inner T = 1 shell, and P8 trimers organize as an outer T = 13 laevo shell. The organization of the P1 molecules in the unexpanded and expanded polymerase complex suggests that the expansion is accomplished by rigid body movements of the P1 monomers. This leads to exposure of new potential RNA binding surfaces to control the sequential packaging of the genome segments. Biological membranes control the flow of molecules into and out of cells, and they transmit information about the milieu. Structural studies of membrane-containing viruses provide one way to study these membranes in situ. Cryo-electron microscopy and image reconstruction of bacteriophage Bam35 to 7.3 A resolution revealed a membrane bilayer constrained within an icosahedrally symmetric pseudo T = 25 capsid. A total of 60 large transmembrane protein complexes affect the curvature and thickness of the membrane. Here, we describe these membrane parameters quantitatively. Furthermore, we show that Bam35 differs from bacteriophage PRD1 in these parameters, even though the two viruses share the same principles of capsid architecture. Most notably, each virus possesses a tape measure protein suggesting a general mechanism for capsid size determination in icosahedral viruses. Comparisons of bacteriophage PRD1 and adenovirus protein structures and virion architectures have been instrumental in unraveling an evolutionary relationship and have led to a proposal of a phylogeny-based virus classification. The structure of the PRD1 spike protein P5 provides further insight into the evolution of viral proteins. The crystallized P5 fragment comprises two structural domains: a globular knob and a fibrous shaft. The head folds into a ten-stranded jelly roll beta barrel, which is structurally related to the tumor necrosis factor (TNF) and the PRD1 coat protein domains. The shaft domain is a structural counterpart to the adenovirus spike shaft. The structural relationships between PRD1, TNF, and adenovirus proteins suggest that the vertex proteins may have originated from an ancestral TNF-like jelly roll coat protein via a combination of gene duplication and deletion. Biological membranes are notoriously resistant to structural analysis. Excellent candidates to tackle this problem in situ are membrane-containing viruses where the membrane is constrained by an icosahedral capsid. Cryo-EM and image reconstruction of bacteriophage PM2 revealed a membrane bilayer following the internal surface of the capsid. The viral genome closely interacts with the inner leaflet. The capsid, at a resolution of 8.4 A, reveals 200 trimeric capsomers with a pseudo T = 21 dextro organization. Pentameric receptor-binding spikes protrude from the surface. It is evident from the structure that the PM2 membrane has at least two important roles in the life cycle. First, it acts as a scaffold to nucleate capsid assembly. Second, after host recognition, it fuses with the host outer membrane to promote genome entry. The structure also sheds light on how the viral supercoiled circular double-stranded DNA genome might be packaged and released. Bacteriophage PRD1 is an icosahedral dsDNA virus with a diameter of 740 A and an outer protein shell composed of 720 copies of major coat protein P3. Spike complexes at the vertices are composed of a pentameric base (protein P31) and a spike structure (proteins P5 and P2) where the N-terminal region of the trimeric P5 is associated with the base and the C-terminal region of P5 is associated with receptor-binding protein P2. The functionality of proteins P3 and P5 was investigated using insertions and deletions. It was observed that P3 did not tolerate changes whereas P5 tolerated changes much more freely. These properties support the hypothesis that viruses have core structures and functions, which remain stable over time, as well as other elements, responsible for host interactions, which are evolutionally more fluid. The insertional probe used was the apex of exposed loop 4 of group B meningococcal outer membrane protein PorA, a medically important subunit vaccine candidate. It was demonstrated that the epitope could be displayed on the virus surface as part of spike protein P5. Bacteriophage PRD1 shares many structural and functional similarities with adenovirus. A major difference is the PRD1 internal membrane, which acts in concert with vertex proteins to translocate the phage genome into the host. Multiresolution models of the PRD1 capsid, together with genetic analyses, provide fine details of the molecular interactions associated with particle stability and membrane dynamics. The N- and C-termini of the major coat protein (P3), which are required for capsid assembly, act as conformational switches bridging capsid to membrane and linking P3 trimers. Electrostatic P3-membrane interactions increase virion stability upon DNA packaging. Newly revealed proteins suggest how the metastable vertex works and how the capsid edges are stabilized.